The home to many of the world’s biggest tech corporations and startups, Silicon Valley is the place to be if you are looking to grow professionally in an inspiring work environment. This blessed region (San Francisco Bay Area), fascinates an entire planet with the abundance of brilliant people that lead this world to progress. Many of those who work here established their permanent residences in Palo Alto. It was the natural (and convenient) thing to do. The homes of those who push forward technology and innovation (scientists, engineers or tech geeks), Palo Alto boasts a variety of lovely functional homes, that reflect their need of order and tranquility. 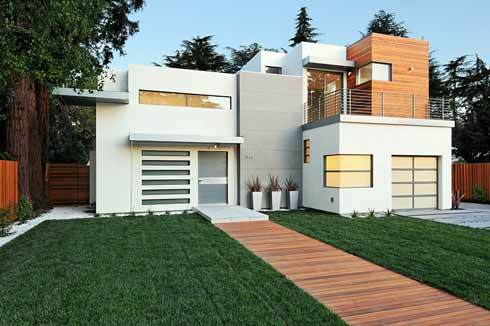 Simply called The Palo Alto Residence, this 5,800 square foot home, designed by CSS Architecture, accommodates a family of five. The parents both work in the Silicon Valley. The house, extremely breezy and comfortable, boasts a wooden exterior and a warm interior. “The design is specific to their close-knit family needs as well as their rigorous sustainability standards. The architecture is contemporary, but it has warm, authentic materials and refined details to accommodate a casual, unpretentious lifestyle.” The house’s linear configuration unveils an open plan living space (fluid and uncluttered), an intimate bedroom, an office, a room for kids and a library.